The Japanese may be known for topping their pizza with potatoes, corn, and mayonnaise, but a deference to traditional Italian ingredients and ways of cooking has also permeated Japanese tastes. The adherence to the vera cucina italiana way of making pizza in Japan, and its warm reception by locals, has attracted pizzaiolos, with the utmost exacting standards, to open up shop. A quick Google search alone of “best pizza in Tokyo” reveals a long list of Neopolitan style pizzerias in and around Tokyo. This bodes well for me and Mr. S’s pizza eating future here. On a recommendation from a trusted source, we ventured to Eifukucho to try some Neopolitan style pies made by an Italian chef (Naples born in fact)–pizza maestro Massimo Minicucci, at his pizzeria, Massimottavio. 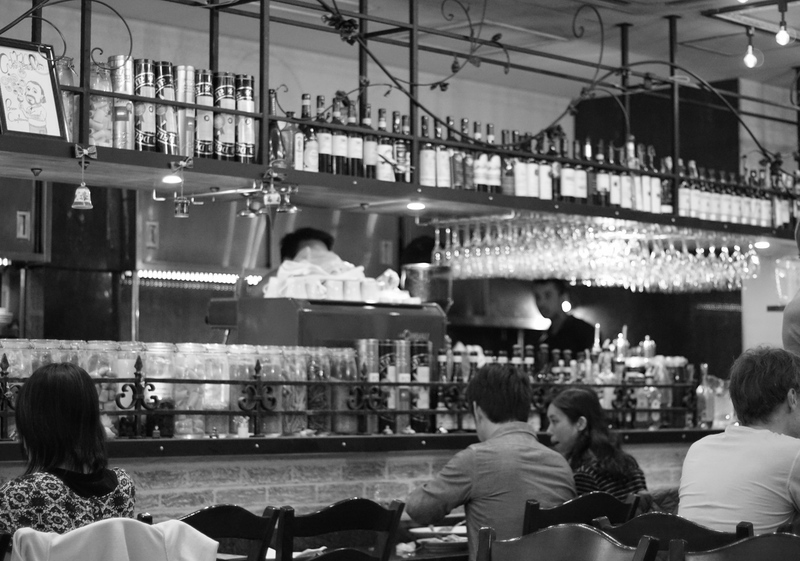 The lengthy menu boasts an impressive list of pizza selections, not to mention a good selection of antipasti, primi piatti (pastas), secondi piatti (meats), wines, and Campari cocktails. 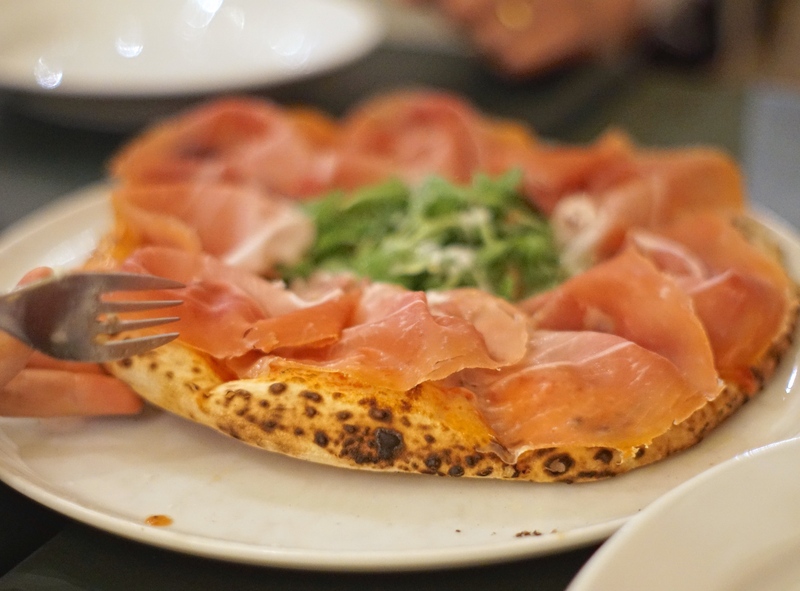 Compared to New York style pizza, Neopolitan style is smaller, with about a 10-inch diameter. These typically are thin crust pizzas having a puffy cornicione, meaning lip or end crust, which is bready and chewy with air pockets. Toppings are used sparingly, to prevent overloading the thin crust, but are always of the highest, freshest quality. Think fresh buffalo mozzarella, ripe San Marzano tomatoes, basil, and extra virgin olive oil. Baked at high temperatures of up to 900 degrees Fahrenheit in a wood-burning oven, cooking times take as little as 1 minute. The pizzas emerging from Massimottavio’s custom oven are soft and elastic, freckled with bits of char, with, every now and then, a black bubble that crumbles at the slightest touch, revealing wondrously chewy and supple dough underneath. Unlike other Neopolitan pizzas I’ve had, the toppings here are quite generously bestowed. 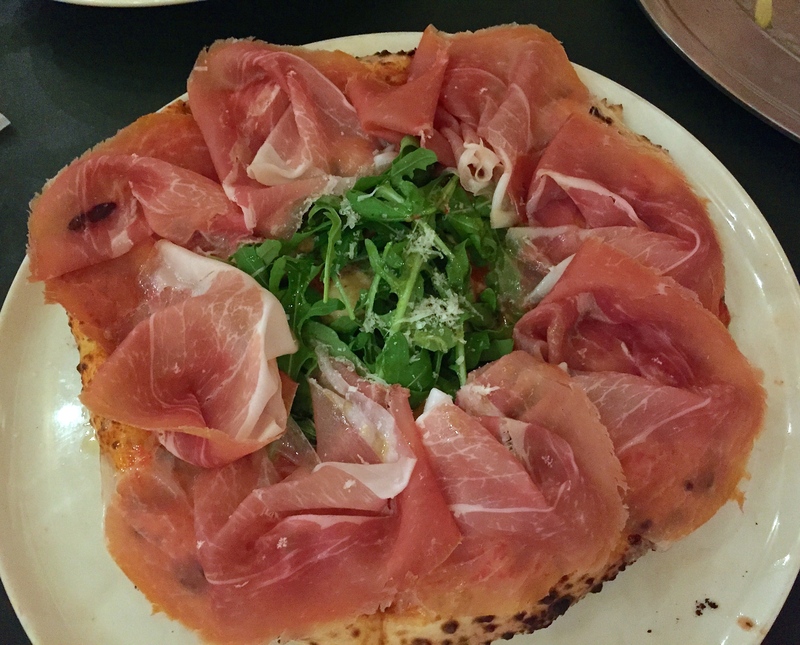 If you’re a fan of the humble hog, you must try the Margherita con Prosciutto e Rucola pizza (a traditional Margherita with prosciutto and arugula): topped with fresh tomato sauce, mozzarella, and a little bit of basil. Then once out of the oven, it’s densely piled with thin slices of prosciutto, scrunched into tall heaps, surrounding a handful of baby arugula that’s been tossed in olive oil and parmesan. The residual steam from the pizza rises to heat up the marbled fat in the prosciutto, allowing the meat to wilt and soften, and the oils to meld with the cheese below. This careful piling-on of the prosciutto allows for, in any one bite, an intense wave of flavor of warmed salty prosciutto balanced by crisp, peppery arugula. 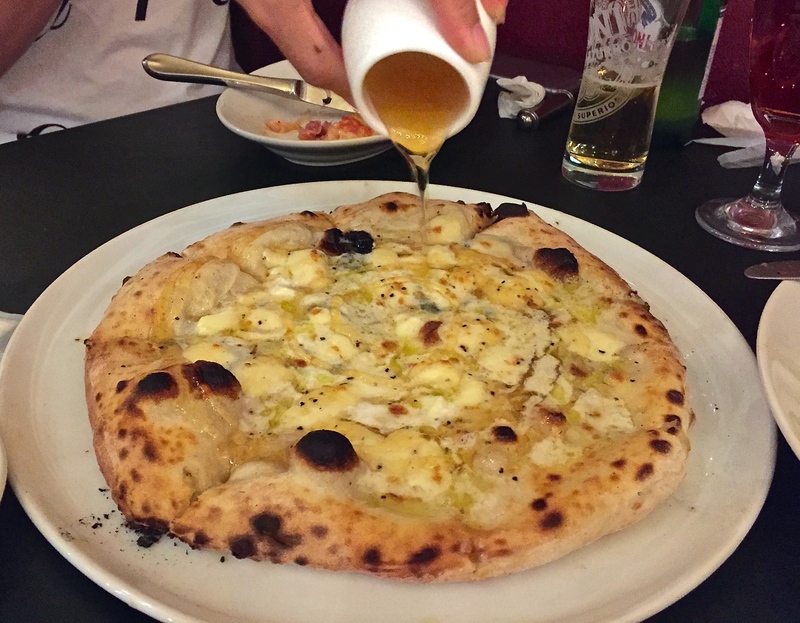 If you are partial to sweet and savory combinations, you will go all sorts of crazy for the Quattro Formaggi pizza (Four cheese) with honey. The four cheeses being: Mozzarella, Parmigiano Reggiano, Taleggio, and Gorgonzola–each contributing its own distinct flavor profile. Mozzarella, being more mild with a milky taste; Parmigiano with a salty sharpness; Taleggio providing a nuttiness with hints of fruit; and Gorgonzola with its salty, blue-veined tanginess. A sprinkling of freshly ground black pepper to finish adds another layer of floral spiciness. When ordered with honey (at an additional cost of about 200 Yen), and you really must do so, the pizza is brought to the table with a small pourer of honey. You can drizzle as much, or as little, honey over the top of the pizza as you’d like. The puffy edges of the cornicione create a perimeter of crust, sealing in the mixture of gooey cheeses, warmed honey, and olive oil. Once the slices are pulled apart, it really becomes a knife-and-fork show, as the toppings ooze away from the crust which, for just fingers alone, can become a salty and sweet mess. The honey, a wildflower variety, adds a layer of mild sweetness that balances out the salty, tangy cheeses divinely. Who knew the combination could be so addictive? The cornicione for both our pizzas was nicely blistered with a sporadic spotting of charred bits–crispy on the outer crust that gave way to a soft and chewy interior. Just the right amount of bread to soak up the delicious toppings of each pizza. On our visit, we also tried some antipasti, including a caprese salad and a mixed antipasti platter, but it’s really the pizzas here at Massimottavio that are the undisputed winners. OMG the garnish is so generous! i bet the pizzas are like you said “undisputed winners”!!! that I really enjoyed the standard information an individual provide on your guests? Is gonna be back often in order to inspect new posts.